It features classic turn-based combat with a unique overcharge mana system and incredible Battle Bursts. Players can explore beautiful, randomly-generated dungeons loaded with traps, puzzles, secrets and loot and an overworld peppered with hidden dungeons, rare bosses and randomly appearing friends and foes. Build your adventuring party by choosing three of six available heroes from the classic Battle Chasers comic series, each with unique abilities, perks, items and dungeon skills. The day has finally come! 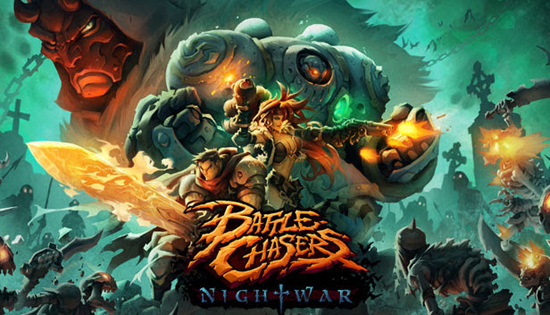 Battle Chasers: Nightwar launches today on Steam, PS4, and Xbox One. From the get-go, this gem has been a pleasure to work on and I'm so happy that everyone will get the opportunity to play this week. $29.99 for a deep dungeon-filled JRPG that's teeming with amazing art and personality.